As the applications for CO₂ refrigeration systems expand, there is a need to increase competencies around its use in the industry. 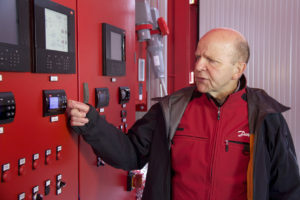 To help address this growing need, Danfoss has developed the Mobile CO 2 Training Unit. 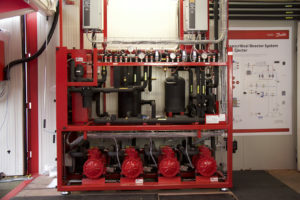 The Danfoss Mobile Training Unit is packed with CO₂ solutions and interactive learning modules. It will be making stops at the Pacific to support our community. CO₂ is rapidly advancing in refrigeration as traditional HFCs are phasing out globally, and retailers are looking for ways to reduce their carbon footprint. The CO2 Mobile Training Unit addresses a critical industry need for training on the emerging technologies in natural refrigerants, which are both a sustainable and economical choice for refrigeration systems. Danfoss’ CO2 Mobile Training Unit will be on display at Sydney, TAFE NSW, Refrigeration and Air Conditioning Trades, Nirimba College, September 12-21; at Melbourne, Danfoss Office - 2 National Drive, Dandenong South, September 27 - October 6; at Auckland, Manukau Institute of Technology (MIT), October 24 -November 2. Danfoss will hold “open house” sessions to observe the training unit’s equipment and components for CO₂ solutions as well as hands-on training sessions led by dedicated Danfoss CO₂ champions who will share their in-depth knowledge of the natural refrigerant’s properties and the opportunities and challenges surrounding the use of CO₂. The CO₂ solutions presented in the mobile training unit range from simple gas-bypass systems to more complex parallel compression solutions with or without heat reclaim. Moreover, the training unit introduces the AHR Expo Innovation Award winning ejector technology, which industry experts recognize as key to the evolution of transcritical CO₂ refrigeration. These ejectors have the potential to enhance the energy efficiency of their systems by up to 20 percent on the hottest days of the year, thereby solving a problem that previously limited the use of transcritical CO₂ systems to milder climates. 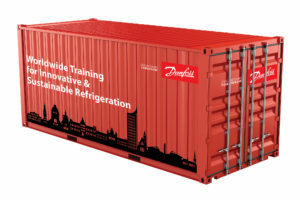 As technologies for implementing CO₂ refrigeration continue to evolve to offer enhanced performance while increasing the ease of use, the Danfoss Mobile Training Unit will constantly be updated with new components, know-how, and learning modules to reflect these changes. As it travels, be sure to visit us and take advantage of this unique industry opportunity. Photo 1 – Danfoss CO2 Mobile Training Unit is a small, mobile, self-contained, hands-on training facility. Photo 2 – The CO2 Mobile Training Unit can be shipped to any Danfoss or customer location worldwide for training by local champions. Danfoss engineers technologies that enable the world of tomorrow to do more with less. We meet the growing need for infrastructure, food supply, energy efficiency, and climate-friendly solutions. Our products and services are used in areas such as refrigeration, air conditioning, heating, motor control, and mobile machinery. We are also active in the field of renewable energy as well as district heating infrastructure for cities and urban communities. Our innovative engineering dates back to 1933 and today Danfoss is a world-leader, employing 24,000 employees and serving customers in more than 100 countries. We are still privately held by the founding family. Read more about us at www.danfoss.com.